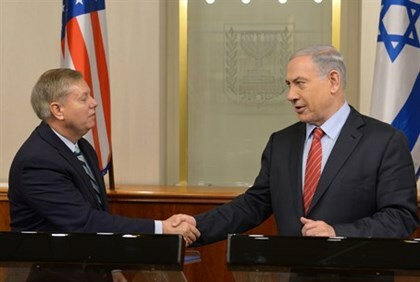 Prime Minister Binyamin Netanyahu met with US Senator Lindsey Graham (R-SC) on Saturday evening, and as the talks began spoke about the threats facing the Jewish state. “We are now faced with two great challenges. The first comes from the Palestinians. The chief Palestinian negotiator, Saeb Erekat, has compared Israel to ISIS (Islamic State),” reminded Netanyahu. “This is the same Palestinian Authority (PA) that joins hands with Hamas, incites constantly against Israel, the kind of incitement that has led to an attack that we witnessed just two days ago of a Molotov cocktail thrown at a little girl, and I commend our security forces for apprehending the terrorists,” continued the prime minister. “I want to assure you that we will stand firmly and reject such a dictate. We always have; we always will,” continued Netanyahu. Netanyahu’s coalition government has been imposing a covert freeze on Jewish construction in those regions for many long months, despite no official foreign request to do so.